NRL legend Johnathan Thurston has questioned the decision by officials presiding over the Cowboys’ clash with the Storm not to stop the game when both Nene MacDonald and John Asiata where floored in a serious collison. The Storm were allowed to play on against 11 men with the game in the balance, much to the outrage of the home crowd at 1300SMILES Stadium when MacDonald went down with a broken and dislocated ankle and Asiata with a hyper-extended elbow. 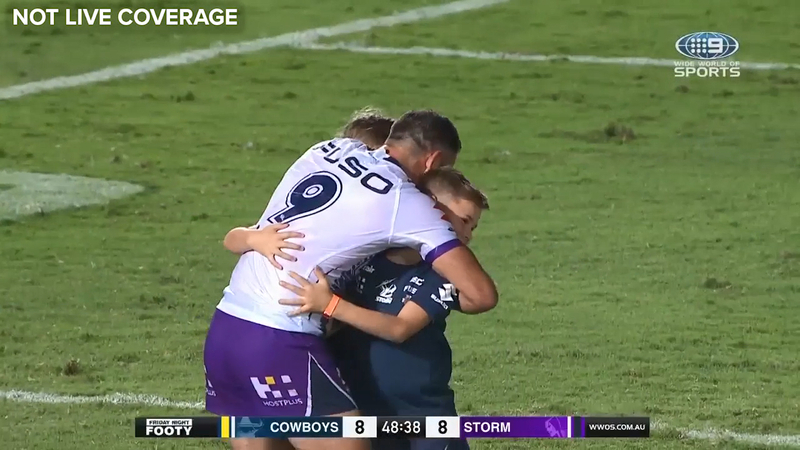 Eventually play came to a halt when the home side managed to floor Cameron Munster, coughing up a penalty in the process, but Cowboys legend Thurston was less than impressed with the match officials. “Clearly I think we’ve seen two players go down, everyone has seen it in the stadium and the touch judge has kept rolling on with the play,” Thurston told Nine’s Friday Night Knock Off. “I understand there is a process there but…there’s a duty of care to the players because there are three players that are down and seriously injured. "The head trainer, the physio and the doctor are on the field all at once, surely that’s alarm bells for the officials." Coach Paul Green blew up in his post-match press conference labelling the incident an “absolute debacle” and a “disgrace”, as he pushes for an NRL inquiry into the incident. The process by which a game is officially halted is a communication from a medical trainer to the touch judge and then on to the referee, but Storm great Billy Slater called for a greater common-sense approach. “I think if they were knocked out cold, they would have stopped the game straight away,” Slater said. “I’m happy with them to take a common-sense approach with it…but I think they common-sense here was to pull the game up.